Everything was great. The screen was missing from the bathroom window, a lot of Mosquitos came in the first night. But that was it. Liked the location. Room was clean. All appliances worked and no loud guests. Bed was comfortable. Access to local nearby lakeshore locations was very convenient. Didn't like the couch, really needs replacement, almost unusable. The front entrance is very dated, odd odor, the fence blocking access to the lake - made the lake Uninviting. Loved the cabin, loved the character- despite the old home smell, non-potable water and dead mouse. My family of 5 loved the lake shore and the walk down was enjoyable as well. We come to the north shore every year and this time was excellent! Location was perfect... Close to COP camp where our daughter works. Wedding a couple houses over was pretty noisy with the late night fireworks but we enjoyed their music! The carpet is interesting in the cabin. Someone could trip on the bumps and extra carpet folds sticking up! Everything was great! We usually stay Croftville Road, but had an extra person join us just a month before we were to come. We called Cascade and to see if another place could be had, and Robins nest came up. We were able to change locations without any hassel or delays. What a gift. Thank you for your help. I prefer the quiet on Croftville Rd and the lake being close, but Robins Nest was a beautiful alternative. We were all taking classes at the Art Colony, so being close was an advantage. The night light that automatically came on when we came home late was a real gift. The only thing that could have been nice would be overhead lights in the bedrooms and the living room. Two of us are signed up for classes again next year, and have booked our usual cabin on Croftville Rd. 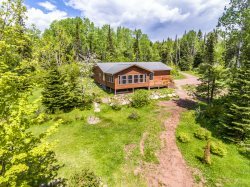 I have been going through Cascade for at least 20 years to get housing in Grand Marais and have always enjoyed the ease of finding just the right place. Everyone there is so friendly and helpful. You are truly appreciated! Great view, easy access to bike trail. Our only complaint is that one of the reclining chairs in this unit was broken and did not work properly. The issue was reported to the front desk. Check in and check out was very simple. We liked the door locks with the code - no keys required. We've stayed with Cascasde properties a number of times and this experience, like all others was excellent. We were in the area for a local mountain bike race and family get together. We like to utilize rental opportunities to make meals and managing activities during our stay a bit easier. Eagles Nest was a great size for our group, was outfitted well, and a great value. we very much enjoyed having a full service kitchen with dishes, pots and pans. being able to walk out on the rocks right on the lake is a plus. the drain in the shower took a while to drain. fresh coffee in the Morning was very much enjoyed. we felt the stay was a little bit impersonal with someone not at the desk very much. the our room was very nice and clean when we arrived. the pool table on the game room did not work. the pool was a good temp and was very clean. there were plenty of fresh towels in our room witch we loved. Location halfway between Canada and Duluth was perfect. Nice home. Loved the home! Only suggestion would be to consider screening in the porch if you can't allow bug repellent use. The weather was gorgeous and we would have loved to be outside in the evening more. The condo was amazing! A block from the store, restaurants everywhere, little shops and the beach was a few steps from our back door! Unit 10 was perfect! The view from the upstairs bedroom was killer! Looked right out to the bay! I loved everything about this place and plan on coming back soon!! The location and cabin were beautiful. We really enjoyed taking our canoe out onto Caribou Lake. We loved how quiet it was - there seemed to be no one else for miles! Very nice place, everything I needed. I would recommend fixing the shower head in #5 as it was difficult to use. Fantastic in every way. We love the cove on Caribou Lake and this part was swimmable, so it was doubly fun. Loon visit almost every night, a very curious fox and kit, ducks, hummingbirds, etc. House so light and airy and the perfect deck for being outside. The home was fine - it was about the right size for our family. The arrangement was good. The location was about 30 miles north of where we ended up spending most of our time. The home was not air conditioned so we spent a couple of pretty warm days there. The pool was fine. Nice to have free washer/dryer access. The grills tended to smoke in our direction. The flies were pretty hungry. I liked having a full kitchen available. Beautiful! House was emaculate. Our family had an amazing time!